It’s true we should be eliminating processed foods from our diet, but anyone with kids knows that’s a challenge. If you are looking for snacks without palm oil, we are updating this list regularly. Here’s a list of easy, grab-and-go snacks without palm oil, especially in snack categories in which companies use palm oil frequently. Toward the bottom is a list of snacks that usually don’t contain palm oil and are typically safe snacks for people who are avoiding palm products. What to look for: You might get lucky with so-called healthier brands, but brownies without palm oil are difficult to find. Be sure to choose Nature’s Bakery’s non-organic brownies. Their organic brownies contain palm oil, palm oil derivatives, and more ingredients overall than their regular, non-organic brownies listed above. For more sweet treats, see desserts without palm oil. Definitely read ingredients before you purchase. In addition to palm oil and palm kernel oil, manufacturers use tocopherols, mono- and di-glycerides, magnesium stearate, glycerin, and other palm oil derivatives. We researched a list of Halloween candy without palm oil. You can choose palm free brands all year. Please check it out. Ready-to-eat cereal makes a great snack but it’s a challenge to find it without palm oil. What to look for: It’s difficult to find them without palm oil because they are typically fortified with Vitamin A Palmitate. Even granola often contains glycerin, glycerine, and/or tocopherols, all which are often made from palm oil. We found one brand, Purely Elizabeth, which makes granola without it. They use pure ingredients in all of their products. You can find their products at Target, Kroger-owned stores, and more. For a list of specific brands and flavors, see our list of cereal without palm oil. There are several Kashi cereals without it. This is one category in which you should be able to find palm oil free snacks. Take a few moments to read labels, and choose the palm free option. What to look out for: Avoid canned chips and snacks. They often contain palm oil, palm kernel oil, and mono- and diglycerides, which are typically made from palm oil. See below for potato chips. We are in the process of researching and adding to this list. Please check back often as we will have many more options to look choose from. What to look for: Look for crunchy and not chewy cookies. Both non-organic and organic store-bought cookies usually contain palm oil. See our list of cookies without palm oil and the ingredients to watch out for. What to look for: You will be surprised how some brands use palm oil and some don’t. Really check ingredients. You might not see the words “palm-” in crackers. However, there are often palm oil derivatives, including mono- and diglycerides and/or enzymes. Saltine-type crackers use these ingredients. What to look for: These make for great snacks without palm oil; however, the only ingredients should be the fruit or vegetable. Any other ingredients should be ones you recognize, such as cane sugar, sea salt, etc. Bare Fruit Chips: Here’s a sample of their flavors without palm oil. What to look for: Many chewy foods contain palm in the form of glycerin, glycerine, glyceryl, and glycol. Avoid these ingredients completely because there’s no way of knowing if they are made with palm oil. Peanut and nut butters make a great on-the-go snack when it’s in its own container or pouch. At home, nut butters are easy to pair with apples, celery or toast. What to look for: Peanut butter is another case when organic is not usually better. Most all of the store-brand, organic peanut butter at our local grocery store contains palm oil. What to look for: Avoid snack bars with chocolate, peanut butter, caramel, fillings, and coatings as these typically contain palm oil. Most chewy bars use palm oil. Some crunchy snack bars do not, especially if they are fruit-flavored. Look for nutritional type bars which use figs or dates to bind their ingredients instead of palm oil ingredients. Glycerin, glycerine and tocopherols are common in snack bars. They are typically made with palm oil. 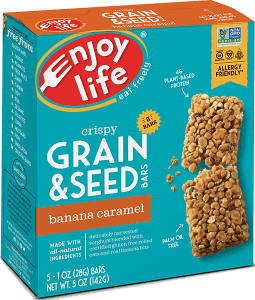 A special shout out to Enjoy Life Foods, first in the US to have their snack line of Grain & Seed Bars and four flavors of their Protein Bites to be certified as palm oil free. For specific brands and flavors, see our post with an extensive list of snack bars and granola bars without palm oil. What to look for: Buy already-popped popcorn. Completely avoid microwave popcorn unless you buy the palm oil free flavors from Quinn Snacks. Most of their flavors are palm-free. It was a nice surprise to see the iconic Cracker Jack is still made without palm oil. Even their Holiday Sugar Cookie Popcorn is palm oil free. See our extensive list of popcorn here. We will be adding to this list. You CAN find potato chips without palm oil. Read labels. Watch organic brands– many contain organic palm oil. Note: Lesser Evil makes ALL of their snacks without palm oil. They make organic popcorn, puffs, and potato chips. What to look for: Many gluten-free and regular pretzels contain tocopherols, a palm oil derivative. Watch out for chocolate-covered and other flavors which have more ingredients. You should be able to find these snacks palm oil free so be sure to read labels before purchasing. This post lists pretzels without palm oil. What to look for: Many shelf-stable meat and jerky products contain palm oil derivatives. Unless you contact the company, you won’t know if the citric acid, flavorings, and spices are derived from palm oil. Epic Bar makes all of their meat snacks without palm oil. Usually these types of kid-friendly snacks do not contain palm oil. Remember, the less processed, the better. Cheese that isn’t overly processed: Read the ingredients. Dried fruit: Look for packages that only contain one fruit and not a mix. Read the ingredients and look for fruit only. Fresh fruit: Wash citrus fruit thoroughly; they can be coated in palm oil ingredients. Nuts, especially if it’s just one type of nut. Added salt is okay but there shouldn’t be other ingredients. Support products, brands and flavors that don’t use any palm oil. You will make a difference. See our ultimate list palm oil free products for more choices. There are certain categories of foods and snacks in which palm oil ingredients are prevalent so always read labels. As with everything, less ingredients is better. Foods usually taste better too. Also, companies change ingredients frequently. Sometimes you will see the exact same product on the shelf with different ingredients. We are updating this list of palm oil free snacks regularly. Please note, snack manufacturers change ingredients and vendors regularly. This is meant for reference purposes only. Please read ingredient labels at the point of purchase before buying snacks and processed foods.